Alma Hunt was one of the great cricketers who graced Aberdeenshire. Even the sight of the piper who performed a lament at his funeral didn’t elicit many raised eyebrows in the Caribbean. Nor even the fact that Hunt, the greatest cricketer his country had ever produced, lived in a house called Mannofield. And yet, as The Leopard has discovered by talking to his daughter, Beverly Baldwin, Hunt was almost as much in thrall to Scotland and Aberdeenshire – the club where he excelled as a professional all-rounder on either side of the Second World War – as he was to his homeland, where he served as one of the most forward-thinking administrators in the sport. Many may be unfamiliar with his name, but this ebullient character deserves to be commemorated. He scored a century in an organised men’s match at the age of ten. 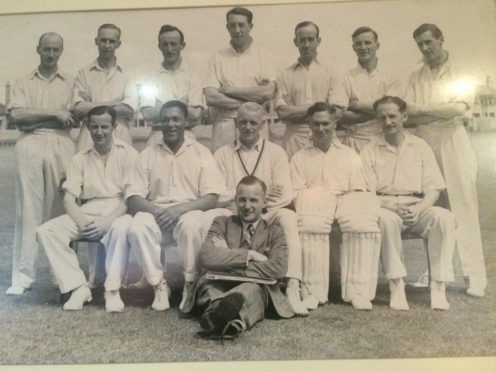 He was selected for trials by the West Indies in 1933 and was considered gifted enough to merit his place until question marks were raised over his eligibility. When he arrived in the Granite City the following year, his exploits gradually became the stuff of legend. Indeed, some of them were so remarkable that even the most Capra-inspired scriptwriter might reject them as being far-fetched. In one fixture against West Lothian in 1939, he skittled out his opponents for 48 with a spell of seven for 11, then padded up for Shire and scored all 49 runs required to win, with eight fours and two 6s in just 25 minutes. And, at the climax, he held an impromptu coaching session with the members of the team that he had just demolished. These prodigious deeds made him famous, not just in the north-east of Scotland, but across his second home and he is one of the few men to have turned out for two different nations. And, even now, 20 years after his death at the age of 88, there’s a picture of him in the clubhouse at Mannofield where his smile oozes radiance, and a deep passion for the game he graced. As Beverly said: “Dad just loved Scotland, particularly Aberdeen, and he was so grateful to be given the chance to play there year after year, and forge friendships with so many others at the club. “It was a joy for him, something he never forgot. Our home in Bermuda was called ‘Mannofield’ after the cricket ground where he spent so many happy summers. “Dad maintained several friendships over there as the years passed with people such as the Cordiner car family and the Walkers shortbread family. Spring is in the air for most people. But one Scot, David Reid, will head off to the Arctic on Monday, as he follows in the footsteps of one of the world’s most legendary explorers. He is the leader of the Arctic Return Expedition, which will embark on a 400-mile trek across the Boothia Peninsula, following the same route as Orkney trailblazer John Rae in 1854. During that historic journey, Rae and his indigenous companions discovered the missing link to the first navigable Northwest Passage in Canada and unearthed the fate of a previous failed expedition by Sir John Franklin. Yet while they succeeded where their predecessors suffered a grisly death, Rae has remained a largely shadowy figure, following his discovery that the Franklin team resorted to cannibalism in the 1840s. Mr Reid, who moved from Scotland to the Canadian Arctic in 1989, and has travelled thousands of miles by dog sled, snowmobile, boat, kayak, bike and other modes of transport, is determined to commemorate Rae’s achievements. He said: “We are not looking to rewrite history, but shine a light on someone who few people have ever heard of. “His name might not be that well-known and yet John Rae was a hugely influential and important figure who was one of the greatest explorers and surveyors who ever lived. “His success was due, in large part, to his willingness to learn from the indigenous people and culture of the region he explored. Iona Fyfe is one of the rising stars of the north-east music scene. But while she has won awards and gained plaudits all over Europe for the quality of her music, the Huntly quine always keeps her feet on the ground. For many years, as a folk devotee, she has read The Living Tradition, which is to her music what Wisden is to cricket. So you can understand her delight that she has appeared on the cover of the latest edition. Yet, true to type, she didn’t respond with pat platitudes or luvvie-style sentiments. Instead, she said: “To have my mug on the cover was always a dream of mine and I’m even luckier to have a four-page featured interview article which was written by the lovely Hector Christie. Ms Fyfe is currently studying at the Royal Conservatoire of Scotland in Glasgow. She has already gained a FLCM in Scottish Traditional Voice from The London College of Music and is one of six National Directors of the Traditional Music and Song Association of Scotland.